"Deep satisfaction to the mind. " In 18th-Century France double chins and porcelain skin was deep satisfaction to the mind. In Ancient Greece women believed it was unibrows and bleached curly hair, and in Renaissance Italy big foreheads and strawberry blonde hair were on trend. Now, here we are in the 21st century, and according to economist.com the skin care industry is worth $24 billion, the cosmetic industry is over $18 billion and https://www.instagram.com/_bri...$38 billion for hair-care. These numbers are growing at 7% a year, more than twice the rate of the developed world's GDP (gross domestic product). Is it a coincidence that the amount of internet users has also gone up 7% in the last year? Social media is undeniably one of the most power forms of marketing. With a single touch you can send a message to hundreds of people; add a few hashtags and the number can turn into thousands. Influencer marketing has become a huge initiative in the marketing industry in present years. For those who don't know, influencer marketing is when a business or service partners up with someone who has a large following on social media and is influential to the desired target demographic. The photo above shows a social media ad taken right from Kim Kardashian's personal Instagram page. Some of the most power influencers / most followed celebrities right now on Instagram are Kim Kardashian (114 million), Kylie Jenner (111 million), and Rihanna (64 million). All three of these women also have cosmetic lines that they heavily market on their social medias.These celebrities not only have contracts to market products, but they're also marketing themselves and their "look" in these stylized and highly edited photos they post. Word-of-mouth marketing also has a different meaning in the digital age. For example, social media platforms such as Instagram visibly shows the user if they are following anyone who's already following the account when they are on said account's page. When scrolling through the app users can also see what posts people they are following have liked. The thing with social media is we are made to believe these celebrities or influencers we follow are posting real-life photos. What we as consumers of social media forget is these post are posed, styled, edited and then filtered. Some celebrities even have a whole team dedicated to their social media presence. But why do we keep holding ourselves to these impossibly high standards? The reality is, if we all had a team hired specifically to photoshop our posts we'd all be "Instagram famous" by now. Social media is a collage of photos that create an unrealistic presence. Mostly everyone, and specifically celebrities only post photos when they're at their happiest and prettiest. You don't post photos of yourself on a bad hair day, so why would they? But this is actually what creates this distorted perception of beauty on the internet and keeps us wondering: what really is the norm? 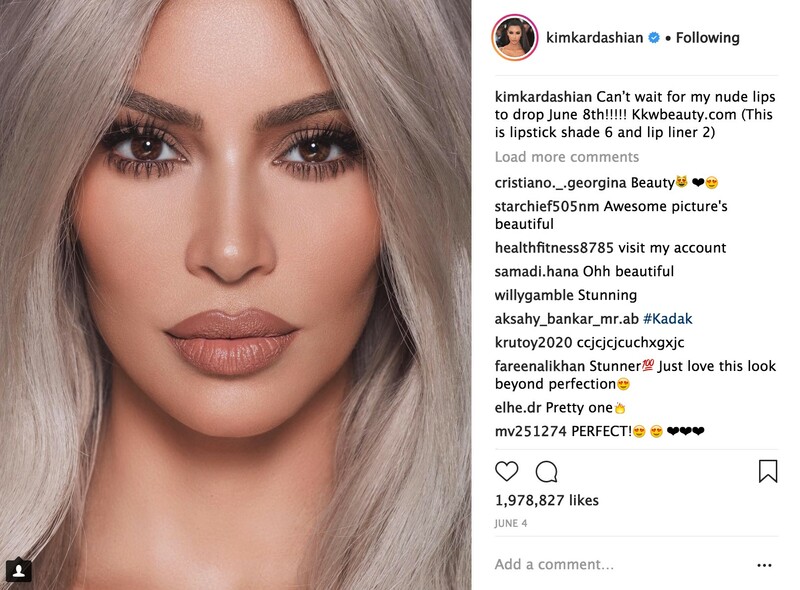 Here Kim Kardashian posted a social media ad for her namesake cosmetic line: KKW Beauty. Social media can sometimes feel like virtual high school: one big popularity contest. In the age of digital media we believe that our self worth is associated with how many likes we receive on a photo. Really think about that. Have you ever thought about taking a photo down because it didn't get as many likes as a pervious one? Or how about the adrenaline rush when you post a new photo and the likes start to come piling in? It's because just like in real life, we as human crave praise from others, and getting a "like" can feed this need. What we need to remember is just because our photos don't get as many likes as Kim Kardashian's doesn't mean that we aren't worthy, smart, motivated, hard-working or even beautiful. All it means is maybe we don't have as much money or fame leverage. That's it. Instead of looking to celebrities and influencers for beauty standards, look at the women in your life. Some of the most beautiful women in this world don't even break 100 likes on their Instagram posts. But the thing is, real women aren't beautiful because of a bikini picture they just posted, they're beautiful for all the things that happen "behind the scenes" or in other words: the real world. Let's stop looking at the "likes" and looking at the person because real life doesn't happen behind a screen. It happens at school when a teacher is comforting a young girl who has been teased, or at a fast food restaurant when a stranger buys dinner for the homeless person outside. That's what social media doesn't show, the beauty that's inside. As a society, we need to focus more on our wellness and the negative side effects social media can have on our emotional wellness. Read Avanti Women's seven dimensions of Wellness Blog post to explore different types of wellness. This article was contributed by Avanti Women volunteer Brittany Bell, who you can follow on Instagram @_britt_bell.